Root canals aren't fun, but there's no need to worry. Michael Moawad, DMD, of Dental Arts of Edgewater wants you to know a root canal doesn’t have to be an unpleasant, anxiety-inducing experience. 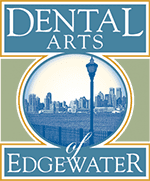 You'll be hard-pressed to find a more experienced dental team than Dental Arts of Edgewater in Edgewater, New Jersey. The team performs root canal procedures all the time. Call or book an appointment online if you’re worried about a root canal treatment. A root canal is a dental procedure intended to remove oral discomfort and restore your tooth. If your tooth becomes severely infected from inside, Dr. Moawad at Dental Arts of Edgewater removes the bacteria and any dying or dead tissue. This way, he can save your tooth and help ease your pain. Roots and tissue inside your teeth can become infected with bacteria as a result of an injury to the tooth or from a cavity that is left untreated. The infected tissue may enter the root or pulp of the tooth if you put off going to the dentist. Ask about treatment. If you don't, the infection could spread even further and lead to other health complications. Dr. Moawad can typically mend your tooth in one or two appointments. You may first need X-rays so he can judge the magnitude of damage to the tooth needing a root canal. At your appointment, Dr. Moawad utilizes a syringe to administer local anesthetic and numb the region. If needed, he puts a small sheet of rubber, or dental dam, around the tooth to protect it and keep it clean during the procedure. Once your tooth is numb, Dr. Moawad forms a minuscule hole in your tooth to find and treat the area of infection in the root. Then Dr. Moawad takes away the damaged and unhealthy pulp using small files and sprays the area with water to remove debris. Once all the infected material is removed, Dr. Moawad either seals the tooth or puts in a temporary filling to protect your tooth until you come back for a permanent crown. Book a consultation online or call Dental Arts of Edgewater if you show even a minor symptom or sign of tooth infection. It could be more serious than you think.